Look, I'm happy and proud that our site has hosted terrific reviews and fascinating interviews from the wild and wonderful Fantasia and also BiFan and also the New York Asian Film Festival and also Japan Cuts and also other film events and screenings. Yet sometimes, a little peace, quiet, and marathon running can be good for the soul as well. "This uplifting, intimate portrait of endurance runners and what motivates them opens around the US in theaters August 17, 2018. 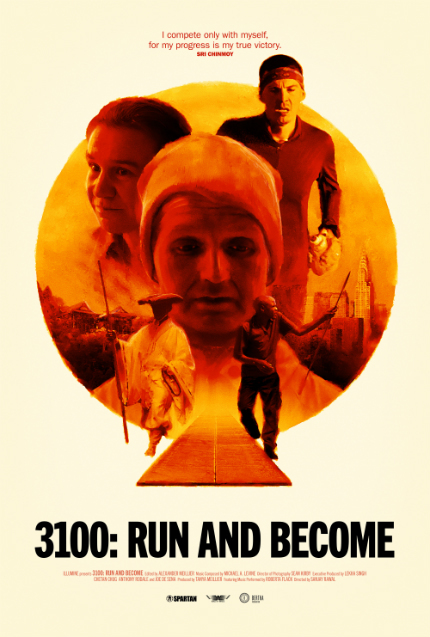 "3100: Run and Become follows Ashprihanal Aalto, an unassuming Finnish paperboy, and Shamita, an Austrian cellist, in their attempts to complete the Self-Transcendence 3100 Mile Race, the world’s longest certified footrace, which takes place each summer June through August. The 3100 encourages runners to discover the limits of their capacities--and to try to go beyond them. And go beyond, they must: the small group of competitors come from all over the world to run a distance that approximates a US cross-country run -- a total of 3,100 miles in 52 days – 5,649 laps around one city block in Jamaica, Queens. "Ashprihanal and Shamita’s 3100 quest takes viewers from the heart of this astonishing event in New York to places around the world where ancient cultures have held running sacred for millennia: the Kalahari Desert, Arizona’s Navajo Reservation, and to the mountain temples of Japan. Through the heroic stories of three other runners (Shaun Martin, a Navajo runner and Board Member of Wings of America; Gaolo of the San Bushmen of the Kalahari; and Gyoman-san of the Monks of Mt. Hiei, Japan) 3100: Run and Become presents a portrait of endurance and transformation. Beyond competitiveness and athletic prowess, they run not for glory but for spiritual enlightenment, universal oneness --or because they simply have the responsibility to run. "3100: Run and Become is directed by Sanjay Rawal (Food Chains) and produced by Tanya Ager Meillier (Alias Ruby Blade, Capitalism: a Love Story). It was edited by Alex Meillier (Alias Ruby Blade, Obscene) and shot in 4K by Sean Kirby (Racing Extinction, We are X, Long Strange Trip). The film’s soundtrack, composed by Michael A. Levine, features an original song recorded by Roberta Flack, her first after suffering a stroke in 2016." Whew! The gentle clip is fine company for Monday mornings everywhere. Take a look below, won't you? More information is available at the official site.